Henri IV, King of France, the son of Antoine de Bourbon, Duke of Vendôme, head of the younger branch of the Bourbons, descendant of Robert of Clermont, sixth son of St. Louis and of Jeanne d'Albret, Queen of Navarre, was born at Pau (Basses Pyrénées) on the 14th of December 1553. He was educated as a Protestant, and in 1557 was sent to the court at Amiens. In 1561 he entered the Collège de Navarre at Paris, returning in 1565 to Béarn. During the third war of religion in France (1568-70) he was taken by his mother to Gaspard de Coligny, leader of the Protestant forces since the death of Louis I, prince of Condé, at Jarnac, and distinguished himself at the battle of Arnay-le-Duc in Burgundy in 1569. On the 9th of June 1572, Jeanne d'Albret died and Henri became King of Navarre, marrying Margaret of Valois, sister of Charles IX of France, on the 18th of August of that year. He escaped the massacre of St. Bartholomew on the 24th of August by a feigned abjuration. On the 2nd of February 1576, after several vain attempts, he escaped from the court, joined the combined forces of Protestants and of opponents of the king, and obtained by the treaty of Beaulieu (1576) the government of Guienne. In 1577 he secured the treaty of Bergerac, which foreshadowed the edict of Nantes. As a result of quarrels with his unworthy wife, and the unwelcome intervention of Henri III, he undertook the seventh war of religion, known as the "war of the lovers" (des amoureux), seized Cahors on the 5th of May 1580, and signed the treaty of Fleix on the 26th of November 1580. On the 10th of June 1584 the death of Monsieur, the duke of Anjou, brother of King Henri III, made Henry of Navarre heir presumptive to the throne of France. Excluded from it by the treaty of Nemours (1585) he began the "war of the three Henrys" by a campaign in Guienne (1586) and defeated Anne, duc de Joyeuse, at Coutras on the 20th of October 1587. 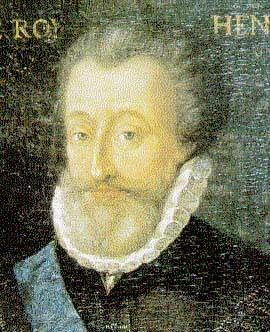 Then Henri III, driven from Paris by the League on account of his murder of the duke of Guise at Blois (1588), sought the aid of the king of Navarre to win back his capital, recognizing him as his heir. The assassination of Henri III on the 1st of August 1589 left Henri king of France; but he had to struggle for ten more years against the League and against Spain before he won his kingdom. The main events in that long struggle were the victory of Arques over Charles, Duke of Mayenne, on the 28th of September 1589; of Ivry, on the 14th of March 1590; the siege of Paris (1590); of Rouen (1592); the meeting of the Estates of the League (1593), which the Satire Ménippée turned to ridicule; and finally the conversion of Henri IV to Catholicism in July 1593 -- an act of political wisdom, since it brought about the collapse of all opposition. Paris gave in to him on the 22nd of March 1594 and province by province yielded to arms or negotiations; while the victory of Fontaine-Française (1595) and the capture of Amiens forced Philip II of Spain to sign the peace of Vervins on the 2nd of May 1598. On the 13th of April of that year Henri IV had promulgated the Edict of Nantes. Then Henri set to work to pacify and restore prosperity to his kingdom. Convinced by the experience of the wars that France needed an energetic central power, he pushed at times his royal prerogatives to excess, raising taxes in spite of the Estates, interfering in the administration of the towns, reforming their constitutions, and holding himself free to reject the advice of the notables if he consulted them. Aided by his faithful friend Maximilien de Béthune, baron de Rosny and duc de Sully, he reformed the finances, repressed abuses, suppressed useless offices, extinguished the formidable debt and realized a reserve of eighteen millions. To alleviate the distress of the people he undertook to develop both agriculture and industry: planting colonies of Dutch and Flemish settlers to drain the marshes of Saintonge, issuing prohibitive measures against the importation of foreign goods (1597), introducing the silk industry, encouraging the manufacture of cloth, of glass-ware, of tapestries (Gobelins), and under the direction of Sully -- named grand-voyer de France -- improving and increasing the routes for commerce. A complete system of canals was planned, that of Briare partly dug. New capitulations were concluded with the sultan Ahmed I (1604) and treaties of commerce with England (1606), with Spain and Holland. Attempts were made in 1604 and 1608 to colonize Canada. The army was reorganized, its pay raised and assured, a school of cadets formed to supply it with officers, artillery constituted and strongholds on the frontier fortified. While lacking the artistic tastes of the Valois, Henri beautified Paris, building the great gallery of the Louvre, finishing the Tuileries, building the Pont Neuf, the Hôtel-de-Ville and the Place Royale. The foreign policy of Henri IV was directed against the Habsburgs. Without declaring war, he did all possible harm to them by alliances and diplomacy. In Italy he gained the grand duke of Tuscany -- marrying his niece Marie de Medici in 1600 -- the duke of Mantua, the republic of Venice and Pope Paul V. The duke of Savoy, who had held back from the treaty of Vervins in 1598, signed the treaty of Lyons in 1601; in exchange for the marquisate of Saluzzo, France acquired Bresse, Bugey, Valromey and the bailliage of Gex. In the Low Countries, Henri sent subsidies to the Dutch in their struggle against Spain. He concluded alliances with the Protestant princes in Germany, with the duke of Lorraine, the Swiss cantons (treaty of Soleure, 1602) and with Sweden. The opening on the 25th of March 1609 of the question of the succession of John William the Good, duke of Cleves, of Jülich and of Berg, led Henri, in spite of his own hesitations and those of his German allies, to declare war on the emperor Rudolph II. But he was assassinated by Ravaillac on the 14th of May 1610, upon the eve of his great enterprise, leaving his policy to be followed up later by Cardinal Richelieu. Sully in his ÉEconomies royales attributes to his master the "great design" of constituting, after having defeated Austria, a vast European confederation of fifteen states -- a "Christian Republic" -- directed by a general council of sixty deputies reappointed every three years. But this design has been attributed rather to the imagination of Sully himself than to the more practical policy of the king. No figure in France has been more popular than that of "Henri the Great." He was affable to the point of familiarity, quick-witted like a true Gascon, good-hearted, indulgent, yet skilled in reading the character of those around him, and he could at times show himself severe and unyielding. His courage amounted almost to recklessness. He was a better soldier than strategist. Although at bottom authoritative he surrounded himself with admirable advisers (Sully, Sillery, Villeroy, Jeannin) and profited from their cooperation. His love affairs, undoubtedly too numerous (notably with Gabrielle d'Estrées and Henriette d'Entragues), if they injure his personal reputation, had no bad effect on his policy as king, in which he was guided only by an exalted ideal of his royal office, and by a sympathy for the common people, his reputation for which has perhaps been exaggerated somewhat in popular tradition by the circumstances of his reign. Henri IV had no children by his first wife, Margaret of Valois. By Marie de Medici he had Louis, later Louis XIII; Gaston, Duke of Orleans; Elizabeth, who married Philip IV of Spain; Christine, Duchess of Savoy; and Henrietta, wife of King Charles I of England. Among his bastards the most famous were the children of Gabrielle d'Estrées -- Caesar, Duke of Vendôme, Alexander of Vendôme, and Catherine Henriette, Duchess of Elbeuf.